Earlier this week I was running out of ideas of what to write about for the Frugal Living WWII Tips series. When I started this I thought that it was going to be a long running series but all of a sudden I ran into a writers block. For the life of me I couldn’t think of anything, I knew there were more tips but they just weren’t coming to me. I think I was having writers block because I wasn’t feeling very good; sore throat, headache, body ache. I called my mom, that’s what I do when I’m not feeling good and she told me to rub some Vick’s on my throat and wrap it with one of my hubby’s clean socks. All of a sudden my writers block was gone, this was one of the many things that my grandma did with Vicks VapoRub. Vicks VapoRub was something that we always had in our medicine cabinet when we were growing up, I also remember it being in my grandmas. I began calling family members to get their ideas for this WWII topic. Much to my surprise they remembered my grandma using it for a bunch of different reasons. I was shocked at how versatile this little jar of vapor was. By the way, the Vicks and sock cured my sore throat. Sore Throat – rub on your throat and wrap with a tube sock. Decongestant – rub on your chest and under your nostrils. Coughs – to minimize coughing, rub generously on your feet and cover with socks. Sore Muscles – massage a generous amount on sore muscles. Headaches – rub a small amount on your temples and forehead. Ear Aches – to relieve pain, apply a small amount to a cotton ball and place in ear. Nail Fungus – rub on infected toenails. The nail will turn a dark color as it kills the fungus. The dark color will go away as the nail grows out. Mosquito Repellent – rub a small amount on exposed skin. Itchy Bug Bites – rub on bite and cover with a band aid. Cracked Heels – rub on feet in the morning and at night. Acne – to clear it up, dab on zit. Cold Sores – rub a little on the area when you begin to feel one coming on. Splinters – to remove, apply to the splinter and cover with a band-aid before going to bed. The next morning the splinter will be on the band-aid. What unusual ways have you used Vick’s VapoRub? We always have a jar of Vicks around, too, but I had no idea there were so many uses for it. Thanks for sharing! Will also work after one or two applications as a drawing salve on boils and cysts. That’s great to know! We’ve always used milk and bread for cysts and boils. Great tip for the nail fungus – eww, I know it sounds gross, but I've just started to notice this on my toes, and the commercial stuff to fix it is really expensive. PS: I hope you get your notebook back. We've used it on feet for coughs and it really does work. One of those crazy old wives' tales that actually works! I came over from Chicken Chick's blog hop. I love these ideas. I haven't heard of any of them. I'm excited to try them on the next one of my family to need it. Thanks! Visiting from YOLO. Thanks! Good to know! We have a bottle of the baby vicks and need to be using it more often for my baby girl's cold and cough! I'm going to dig it out tonight and get to work with it! I had no idea how versatile it was! Yep, we had one of those as well. 🙂 Worked wonders. Yes, good advice, try them. That is an impressive list of ways to use it! I never knew how many things it can be used for. Thanks for the share! What great ideas. I need to get a bottle. Always had it around but never used it. I see several ways I can put it right to work, right now. Thanks! I've heard a few of these, but not all. Love these – especially about the zits and heels! This is great! I have never seen these uses, very good to know. Thank you so much for sharing at Pretty Things this week! I had no idea you could use it for so many things! Oh yes! I think Vicks is one of the best things invented. I also use it to decongest my sinuses and ears when my allergy medicine isn't enough. I just spread a bit on my sinus area on my head and face and a bit around each ear and about an hour later all is better. This is also great to use on ticks. Just dip a cutip in vicks and apply to the back of the tick which will cause the tick to let loose easily because it can not breathe. My Dad swore by Vicks for the sinus troubles:) Pinned! Visiting from the Clever Chicks Blog Hop. 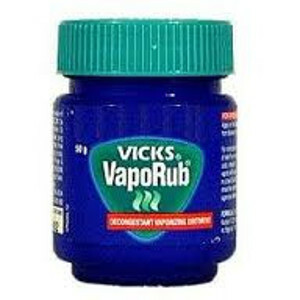 We always had Vicks Vapor rub growing up and I still keep some in the cabinet. But I only knew of using it for chest and under nose. Oh, and Grandmas would swallow a small dab if she had bronchitis. I never could stomach that…but she swore by it. It is very cool to learn all of these other uses. Thanks! I can testify that it works for coughs, by rubbing on bottom of feet. Didn't kick it completely, but definitely a noticeable reduction. Stopping by from the Bloom Designs Link Party! Love these ideas! I've used several of them in the past, but not the zit one or the headache one–those really piqued my interest! Thanks for sharing! Love these tips! Thanks for sharing, this is awesome! My mother would always pull this out when we had a cold and put it on a hankerchief and pop in our shirt to breath in. Worked a treat so long as you did not put too much on – then your eyes would just run! I can almost smell it, gosh, I haven't seen Vicks in years! My mom always put it under my nose or on my chest as a rub when I was little and sick. I love Vick's when I have a bad cold. I remember my granny rubbing our temples with it when one of us had a headache – it worked! Great list – I never knew most of these things on this list! Thanks for sharing! I didn't realize all that it helps. Thanks for sharing at Rustic Restorations Weekend. We love Vicks here too! Mom had us do the same thing growing up. She used a washcloth instead of a sock. I remember her safety pinning it in the back. The Vicks always did the trick. I have to share a funny story. One day I was at my girlfriends house. We were either 6th or 7th graders. Her little brother came in with a Kotex pinned to his neck. 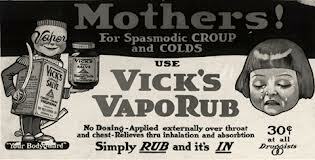 That's what her mother used for her Vicks Vaporub sore throat treatment. Of course he had no idea, but all us girls could do was giggle. Thanks for sharing with SYC. Stopping in from Share it Saturday. I'm a Mentholatum girl myself — but DH swears by his Vicks! It does have a lot of good uses! Thanks so much for sharing on Busy Monday! Great info! Thanks for sharing on The Creative HomeAcre Hop! Hope to see you tomorrow on the next hop! Wow! Who knew? Thanks for sharing I'll have to give some of them a try. Thanks for linking up at Transformed Tuesday. Hugs, Peggy. I'm a new follower. An ear ache? Really? COOL! I am just loving your whole WWII series! I remember my mom doing the rub and sock on me. I always seemed to work however I have never tried it on my kids. I should they all have sore throats right now. :( However I often rub it on their chests and feet. I wish I had seen before all 3 of my kids have become sick. I am definitely picking up a jar for next time.. (or in case I am next.. LOL) You have been chosen as today's Dare to Share Feature of the Day. Believe it or not, we have no Vick's on hand. Looks like I better add it to my shopping list. Another use for Vicks is to rub on furniture if you have puppies as they dont like it and your furniture is safe. Wish I had known this before my foster had pups. From Ros, in Australia. Feels great on fresh tattoos as well! It does work great for headaches, it’s pretty amazing stuff! My mom does the same thing and swears by it. if it gets in your lungs you will have it there until your dying day. If you don’t believe me just ask your Dr.
Rub Vicks on your feet and ankles in the summer time and the ticks will stay away. They HATE IT! I was doing this to help me sleep at night when I discovered that my husband always had tons of ticks on him ,and I hardly had any! I wondered if it was the vicks, so the neck time I found one on his shirt, I picked it off and put it in the sink and smeared a thin circle around it with Vicks, to see what it would do. It was losing it’s MIND–running all around, trying to figure out how to get out of that circle, but not ever touching it, or crossing the line. It was a literal fence, keeping it in. Then, I pushed it into the vicks “fence” , and within a few minutes, it was dead. Ticks breathe through their exoskeleton–they find us by our scent, and the smell of eucalyptus is too much for them. It just shuts them down. My elderly Aunt used Vicks vapor rub to get rid of hemroids! Putting Vicks on your uh… down there? I’d think that’d be extremely painful… If anyone reading this is gonna try using Vicks for this, I’d be careful! I always use vicks on hubby and kids if they are feeling bloated. Just rub on their tummies snd keep warm. Relief within a few minutes. Good to know, I hadn’t heard that one before. I am in a medical field but I’ve always believed how these stuff really works! My mom proved it so many times how amazing VicksVaporub is since I was young. Tho, I haven’t heard of using it for sore throat and wrapping with tube socks. I have a really bad sore throat since yesterday. It is so painful to swallow that I actually lost my appetite. I tried searching for the best way to solve my problem and I found this amazing trick. Tried it actually jst a couple hrs ago and now I am able to eat! Pain is MUCH bearable! Love this trick and will totally recommend it. I also tried rubbing some on my feet and wore socks. Maan… these stuff are amazing! So blessed to find these! Thank you for sharing! scabs began. Best thing in the world for cuts and scrapes. A really unusual trick. We had a male Siamese cat who was trying to tear our door down to go out to woo a female kitty in heat. Using a minuscule amount of Vicks rub I spread it gently around his nose. It worked to cool his ardor but to the day our Sassy cat went to heaven – anytime one of used vicks, he sought us out. It must have been a fond memory for him! Wow, now that’s one that I never would have thought of! It did give me a good laugh though. Thank you! I especially like the one for coughs, it works great! Can I please get on uour mailing list?